President Obama requested $500 million from Congress on Thursday to train and equip what the White House is calling “appropriately vetted” members of the Syrian opposition, reflecting increased worry about the spillover of the Syrian conflict into Iraq. The reportage is a stunning entanglement of contradictions, claiming that the additional funding for terrorists fighting in Syria will somehow address “spillover” that is in fact a direct result of US, NATO, and their Persian Gulf collaborators’ creation, expansion, and perpetuation of the war in Syria in the first place. The training program would be a significant step for a president who has consistently resisted providing military aid to the rebels in the conflict in Syria, and has warned of the dangers of American intervention. But military and State Department officials indicated that there were not yet any specific programs to arm and train the rebels that the money would fund, nor could administration officials specify which moderate Syrian opposition members they intended to train and support, or where they would be trained. Despite the NYT’s attempt to portray the US as having “consistently resisted providing military aid” to terrorists operating along and within Syria’s borders, the US, UK, NATO, and the Persian Gulf monarchies have provided terrorists hundreds of millions in aid, including weapons, equipment, and even vehicles. NATO-member Turkey has also provided air and artillery cover for terrorists during cross border operations including most recently in the northwest village of Kessab. And despite assurances that these hundreds of millions in aid was going to similarly “vetted” “moderates,” terrorist organizations including Al Qaeda’s Al Nusra and Islamic State in Iraq and Syria (ISIS) have achieved uncontested primacy among militant groups fighting in Syria. 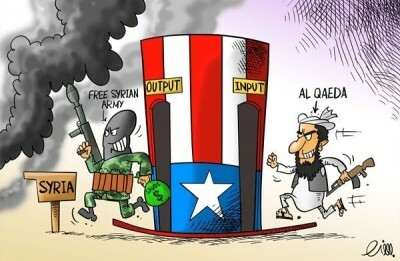 If the US and its regional collaborators have provided “moderates” with hundreds of millions in aid, who has provided Al Qaeda with even more to explain their now state-sized holdings not only in Syria but now in northern Iraq? Speaking from a safe house on the outskirts of the Turkish town of Antakya, Jamal Maarouf, the leader of the Syrian Revolutionary Front (SRF) told The Independent that the fight against al-Qa’ida was “not our problem” and admitted his fighters conduct joint operations with Jabhat al-Nusra – the official al-Qa’ida branch in Syria. And even with the Independent quoting the would-be recipients of yet hundreds of millions more in Western aid, admitting they work in tandem with Al Qaeda which is now cutting a swatch of horror and mayhem across neighboring Iraq, the truth is from the very beginning, years in fact before the so-called “Arab Spring” even began, the US, Israel, and Saudi Arabia conspired to overthrow Iran and its arch of influence, including the government of Syria, Hezbollah in Lebanon, and surely the Iran-leaning government in Baghdad, by organizing, funding, and arming sectarian militants including Al Qaeda itself. Throughout the rest of Hersh’s nine-page report, which came out 4 years before the so-called “Arab Spring” unfolded, is outlined in specific detail how the West and its regional allies including Israel and Saudi Arabia, were already funneling in cash and arraying armed sectarian extremists against Hezbollah inside of Lebanon and against the government of Syria. Hersh’s report even included a retired CIA agent who portended the sectarian nature of the impending, regional conflict. There is no denying that this premeditated conspiracy described in 2007 has now been brought to full fruition in the form of a increasingly horrific sectarian conflict the West is now poised to further expand by injecting a half-billion dollars into terrorist operations in direct support of ISIS campaigns on both sides of the Syrian-Iraqi border. For the NYT to claim injecting more cash and weapons into efforts to topple governments currently fighting Al Qaeda’s various regional franchises is some sort of attempt to contain “spillover” is disingenuous at best, and at worst a poor attempt to cover up what is essentially Washington’s open state sponsorship of the largest terrorist force ever assembled in modern history.